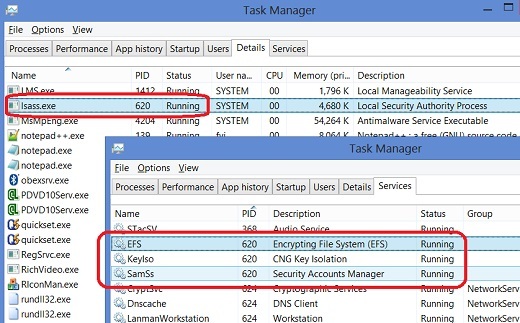 How to identify the lsass.exe process on and its hosted services on Task Manager on Windows 8? I want to know how much memory is used by lsass.exe. 1. Type in "taskmgr" in the Start button search box to start the Task Manager. 2. Click the "Process" tab. Then click the "Image Name" to sort the process list by name. 4. Right-mouse click on "lsass.exe", and select "Go to process(es)" from the context menu. The "Services" tab will open with services running under "lsass.exe" highlighted. This confirms that all 4 services are running under a single shared process of "lsass.exe" with PID = 600.